While some people will only eat beans if they are forced, I love them. When I was growing-up my dad was a meat and potatoes kind of guy so beans rarely made an appearance. Then when I turned 15 I decided to become a vegetarian. I quickly had to learn to make beans. My first dozen attempts were less than stellar, the flavor wasn't great and beans weren't a favorite food of mine. Then I discovered that when made the right way, beans can be delicious. My kids have grown-up eating beans. To them they are just another food and they don't think twice about eating them. My oldest in particular loves pinto and chickpeas and will pick them out of dishes. This week I have made a number of bean dishes since my schedule has been hectic and they are hearty and create a ton of leftovers. 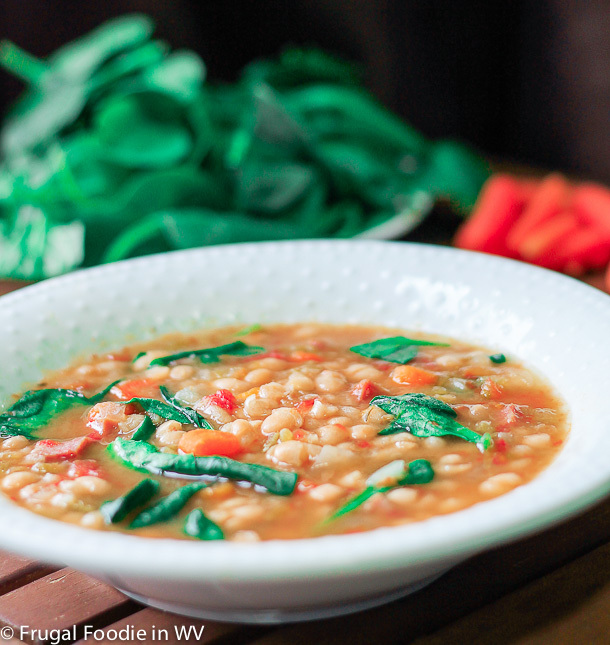 Today I tried a new recipe for Smoky Navy Bean Soup from the March 2013 issue of Family Circle magazine. This recipe has 10 ingredients. It takes 10 hours of cooking on low, 15 minutes of prep and makes 8 servings. This was a recipe that I followed pretty closely with only a few modifications. Instead of adding 6 cups of water, I added 3 cups of homemade chicken stock and 3 cups of water. For the carrots I used pre-peeled baby carrots, approximately 15. I chose to skip the step of pureeing the soup. My kids were hungry and I like my bean soup to have more texture. I followed the remainder of the recipe as written. I was surprised by how many leftovers I had of this soup. The recipe states that it makes 8 servings, but I had enough leftovers for at least two more meals. Make sure to adequately salt the soup before serving, it will need it. I did find that the ham steak that I used ended up a little tougher than I like, next time I would use a fatter cut of ham. Overall, an easy bean soup recipe that is great for fall and winter. For the recipe go to Smoky Navy Bean Soup. Sounds perfect for a cold winter day! Great recipe. This is perfect for a cold, damp kind of day. Thanks :) It is great for cold, damp weather! Hello, I started following you on the Linky Followers. I am stopping by from the Big foot Tribe blog hop. I love navy bean soup. This looks terrific.Perfect picture. Thanks :) I love navy bean soup also! That definitely looks good enough to eat! Thanks :) I love recipes that use the slow cooker! Exactly the sort of recipe I was craving! Thanks! No problem :) If you try it tell me how it turns out! Yummy! Thanks for linking up at Family Fun Friday at Happy and Blessed Home! I found this old post and I have some collards from the garden and a package of dried Navy bean. Will be making a quick stew tonight. Thanks for the recipe.